Arrow T Ranch - Yavapai County, AZ - Headquarters West Ltd.
A short 15 minute drive from downtown Prescott leads you to the Arrow T Ranch at the end of a private road and behind a locked gate. The ranch is a short distance off of Williamson Valley Road. 162.617 total acres comprised as follows: 2.617 surveyed acres deeded and 160 acres State lease (#23-111010). The ranch’s carrying capacity for the State grazing lease is set by the ASLD for 2 animal units year round. The Arrow T Ranch is set amidst beautiful oak trees and pinon pines near the base of 7,625’ Granite Mountain. The ranch is at a mile high elevation and is set in a very private and scenic setting. The deeded land is part of a seven lot subdivision which is fully surrounded by State land. The ranch’s deeded land is the northwestern most parcel in the subdivision and borders State land on the northern and western boundary. The main home and back patio area including the sauna, hot tub, screen room and green house are set in the extreme northwestern corner and offer unobstructed views with the utmost privacy. Main House: 3,615 sf, remodeled in 2009 with granite counter tops, slate, tile and laminate wood floors, new fixtures, wood blinds, interior knotty pine siding with high beamed ceilings and a large rock fireplace. The main home has three bedrooms and two and a half bathrooms, kitchen (all appliances included), dining area, enclosed Arizona room, sitting corner, office area, laundry room and an attached two car garage. The home has radiant floor heating, wood and propane fireplaces and dual zone forced heat and air conditioning. Guest Quarters/ Barn: 1,760 sf total with about a 1/3rd of the barn being guest quarters. The guest quarters were completely remodeled in 2008 and consist of one bedroom and one bathroom. There is a half kitchen with granite counter tops and new fixtures. The barn is fully finished and has three enclosed stalls with pipe fencing, two enclosed storage rooms and a breezeway with two rolling doors. Detached Garage: 1,200 sf fully finished detached garage with rolling door and two entry doors for storage. There is a concrete slab and basketball rim next to the garage. Green House: 360 sf, fully finished, drained and heated. The greenhouse was built in 2009 and has large windows, sky lights, ceiling fans and non-freeze spigots. Outside of the greenhouse is a fully fenced garden. Screen House: The screen house was built in 2009 and is 240 sf. It has electric and a ceiling fan and makes a great spot for sleeping or dining. Other improvements: There is an electric sauna (3 years old), hot tub, pipe and cable riding arena and matching pipe dog run. The exterior of the deeded land has pipe fencing and there are several pipe corrals adjoining the barn that also has a four horse shade/pen. The grounds are beautifully landscaped with large trees, lawn area, rock flower planters and a back patio on a concrete foundation. State Lease Improvements: A 1,000± sf slump block barn with six stalls and one enclosed feed/storage room with a breezeway and rolling doors. A 1,200± sf manufactured home on a foundation with a patio and fireplace. There is also a slump block well house. These improvements do need some work but give the owner a lot of options. The entire boundary of the state lease is fenced with barb wire. Electric and telephone services are to the residences. Water is from one domestic well (exempt) and sewer is from septic tanks. Natural gas, trash, television and internet are from private providers. The property is within the Prescott AMA. 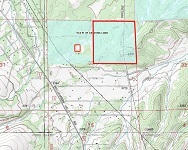 The deeded land is zoned R1L-70 with Yavapai County, which has a 70,000 sf minimum parcel size. 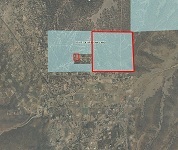 The ranch is located in Zone X on FEMA FIRM Map No 04025C Panel No 1715F with an effective date of June 6, 2001. Zone X determined to be outside of the 500 year floodplain. Total 2010 property taxes are $4,789.58 and 2010 State grazing fees are $437.76 for a total of $6,215.54. 2010 Arizona State Land Dept. fees are $2.28/AUM. The ranch has large oak trees, pinon pine, fir trees, multiple fruit and shade trees. Mule deer, javelina, mountain lion, bobcat, and fox are the typical neighbors. The Granite Mountain Wilderness on the Prescott National Forest is a short drive away where you can trail ride and hike. Small ranches of this caliber in the immediate Prescott area are quite rare. A great aspect of the Arrow T Ranch is the 160 acre State lease allows an owner to ride out from the ranch for a romantic western ride. The ranch is a short drive from downtown Prescott and the vibrant Courthouse Square wi th abundant dining and shopping venues. $1,250,000 cash - the ranch is shown by appointment only to qualified buyers. Please click here to download (about 2 MB) a printable brochure in Adobe Acrobat format. If you get frustrated trying to make this work on your computer, don't hesitate to ask us to mail you a printed and bound brochure instead.